Instead of £839.00. You save £41.95 due to the online discount . 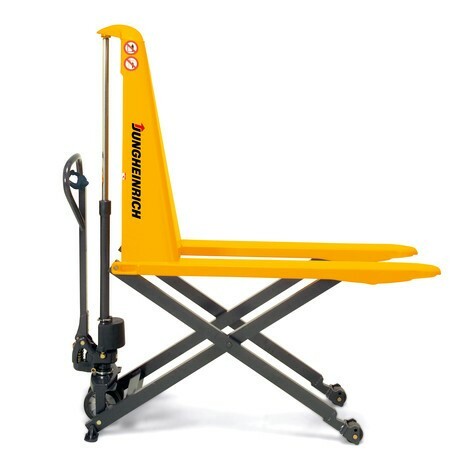 The manual-hydraulic AMX 10 scissor lift pallet truck, with width across forks of 680 mm, is a premium Jungheinrich product offering durable and reliable quality. 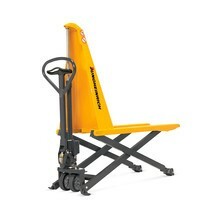 As a combination between a pallet truck and lift table, the scissor lift pallet truck is extremely flexible and versatile. Activities involving frequent bending and heavy lifting can quickly have an effect on employee health. Supported by the automatic quick lift up to 120 kg, loads weighing up to 1000 kg can be raised to an optimum ergonomic height with just a few pumps of the tiller. 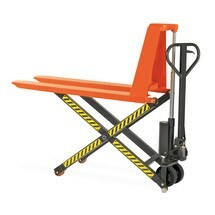 The truck thus serves as an invaluable aid when working with pallets or pallet cages. 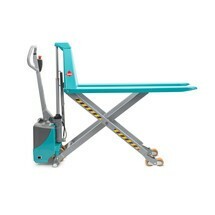 It goes without saying that you can also use the AMX 10 as a hand pallet truck to transport your goods. The lift/travel/lower functions are controlled via the ergonomic tiller handle, which can be easily operated with either hand. Thanks to the special lowering valve, loads can be set down with utmost control and precision. You can adjust the working height of the AMX 10 up to a height of 800 mm. As of a lift height of approx. 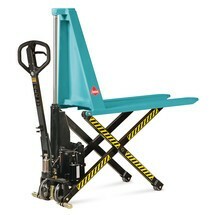 400 mm, the steering castors lift off the ground, with side-mounted support feet providing additional stability. 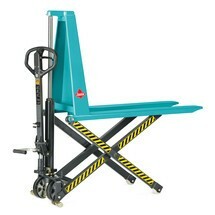 They secure the pallet truck, which can then no longer move and thus serves as a useful work table. 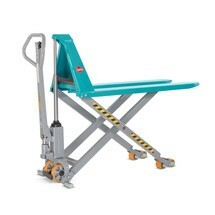 You also have the option of equipping the scissor lift pallet truck with lateral support rollers so that you can also move it when raised. The fork arms, with their closed fork tips and welded construction, are torsion-free and highly durable. 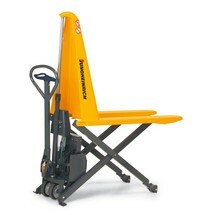 As a result, the scissor lift pallet truck retains its shape even under the heaviest loads. The single-stage lift cylinder makes the AMX 10 particularly resilient and minimises the risk of leaks. The overload valve protects against excess loads. 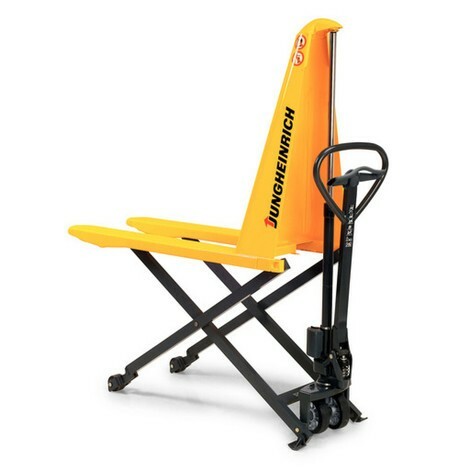 Enjoy utmost flexibility by ordering the manual-hydraulic Jungheinrich AMX 10 scissor lift pallet truck, with width across forks of 680 mm, from our shop in your chosen configuration.